What are we talking about this time? This time we will be talking about ElasticCache. So what exactly is ElasticCache? I have chosen to use MemCached for this example. So once you have setup a cluster, you will see the nodes created for you in the AWS console. If you go and examine the nodes you can click on one of them, and you should see a dialog similar to this. It shows the nodes configuration end point, and also the actual nodes in the cluster. But it also shows you how to download a client library for use with .NET. // instantiate a new client. // Store the data for 3600 seconds (1hour) in the cluster. // The client will decide which cache host will store this item. And to be honest that is all there really is to it. 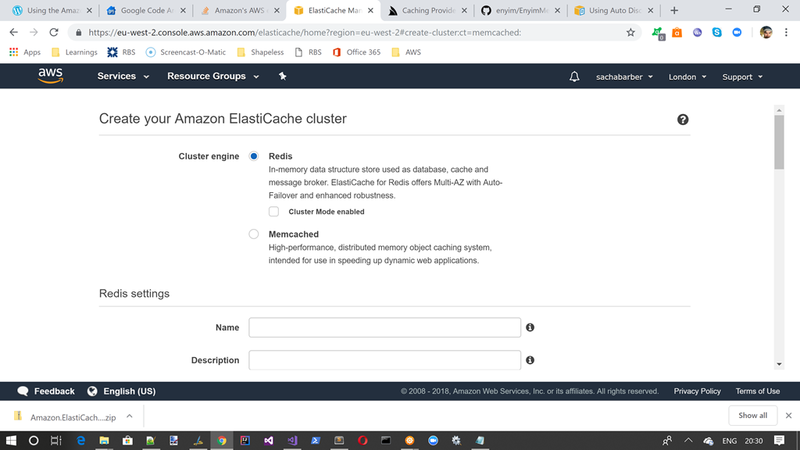 I guess the final point is, if you do not like this MemCached .NET client, AWS Elasticache is “memcached compatible” so that really means you can use any memcached library of your choosing.